I'm extremely sorry to announce that I just received a phone call telling me the management of Ronnie Scott's have cancelled my night there tomorrow (15 Nov). Apparently they double booked the venue and forgot to tell the promoters and DJs until this evening! Unfortunately there was absolutely nothing I could do to change this decision. All I can do is offer my sincerest apologies to you all. Especially for the unbelievably short notice. If I had any idea this could have happened I would never have arranged the night there. Not only has this messed up my night and wasted many hours of my time spent in promoting and preparing it, but another 100 or more people have also had their Saturday night messed up including people who were going to celebrate their birthday there and some who had planned to travel from outside of London. Please could I ask you to pass this information on to anyone you know who might be planning on attending tomorrow night? I would really hate for anyone to waste their time and money travelling down there. I can only apologise again and assure you I will do everything in my power to never allow this to happen again at any venue I DJ at in the future. Fortunately tonight (Friday the 14th November) is still happening, so come down to Chick-A-Boom at The Vibe Bar to hear me and Mistah Brown plus special guest Andy Smith (Portishead, Jazz Cafe, Lost & Found, Document, etc.). We'll be playing plenty of ska, reggae, Northern soul and rockin' rhythm & blues. New Orleans r&b and funk legends Allen Toussaint and Dr. John are to headline a free festival at The O2 this weekend along with a large line-up that covers blues, r&b, gospel, jazz and other old-school musical genres associated with the Crescent City. The festival is possibly the largest ever celebration of New Orleans music and culture outside of the USA and runs from 4pm til 11pm on Friday and 3pm til 11pm on Saturday. Admission is absolutely free and there is no need to book - just turn up. As well as all the live music across 3 stages, there will also be traditional cuisine on sale and even a recreation of the legendary Bourbon Street. Running from 7th-19th November at the Evil Gallery in Shoreditch, "Never Shall Be Slaves?" is a solo show of new paintings by cult artist Twinkle Troughton. Following on from her last solo show - "Cor Blighty" - in late 2007, Troughton has continued with the theme of Britishness, but her work now shows a darker direction. The paintings in this new collection contain elements that in a way we are all slaves to, such as the media, fast living, drugs and material goods. Troughton wishes to make us think about our fixations with accumulation and consumption as well as the way we treat each other. Born in Coventry and raised in Leamington Spa, Twinkle Troughton moved to London to study fine art and received her BA in 2001. Over the last few years she has developed both her technique and her trademark of bold and bright, slightly surreal paintings which, whilst paying homage to the pop artists of yesteryear, also conjure up nostalgia for a Britain which has seen change at an ever-increasing rate over the last decade. With commissions from the likes of Damon Dash and Howard Marks under her belt, as well as being shortlisted for the Celeste Art prize in 2006, Twinkle Troughton is a name to watch out for. She is currently represented by the Stella Dore Gallery on Brick Lane and exhibits frequently in London as well as throughout the UK and Europe. Blues and r&b fans, don't miss this! 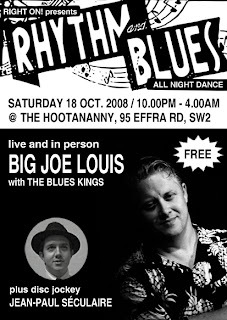 On Saturday 18th October I will be DJing at a Rhythm & Blues allnighter at The Hootananny in Brixton alongside a live set from the fantastic Big Joe Louis - one of Britain's greatest blues voices. Born and raised in Jamaica, Big Joe Louis has lived in Britain since the 1980s and has been twice voted "Best UK Male Blues Vocalist". 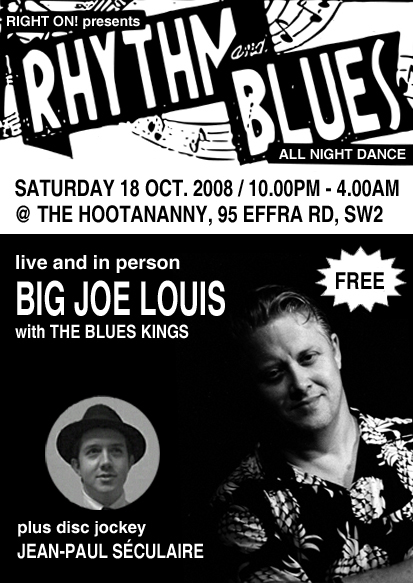 His band The Blues Kings are widely considered one of the best in the UK. As well as recording with David "Honeyboy" Edwards and Van Morrison, Big Joe Louis has played with artists such as: Lazy Lester, R L Burnside, Big Jack Johnson, Homesick James, Louisiana Red, Big Bad Smitty and Big Lucky Carter to name but a few. His albums for Blue Horizon and Ace Records are highly acclaimed and his latest dancefloor 45 "Go Go Train" has won him popularity on the mod scene. You can expect a rockin' dancefloor set from Big Joe Louis to get you on your dancing feet and I'll be keeping the vibe going before and after with some killer diller 50s and 60s r&b and soul platters as well as some ska thrown in for good measure. To top it all off, admission to this night is absolutely free. But arrive early to guarantee admission!